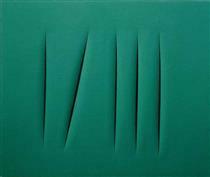 Lucio Fontana (Italian: [ˈluːtʃo fonˈtaːna]; 19 February 1899 – 7 September 1968) was an Italian painter, sculptor and theorist of Argentine birth. He was mostly known as the founder of Spatialism. Born in Rosario, province of Santa Fe, Argentina to Italian immigrant parents, he was the son of the sculptor Luigi Fontana (1865 — 1946). 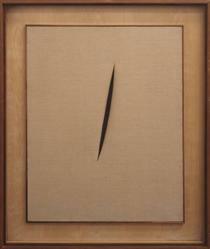 Fontana spent the first years of his life in Italy and came back to Argentina in 1905, where he stayed until 1922, working as a sculptor along with his father, and then on his own. Already in 1926, he participated in the first exhibition of Nexus, a group of young Argentine artists working in Rosario de Santa Fé. 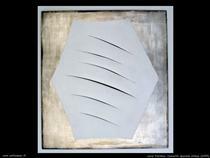 In 1927 Fontana returned to Italy and studied under the sculptor Adolfo Wildt, at Accademia di Brera from 1928 to 1930. It was there where he presented his first exhibition in 1930, organized by the Milano art gallery Il Milione. 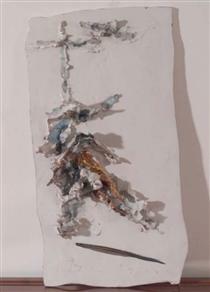 During the following decade he journeyed Italy and France, working with abstract and expressionist painters. 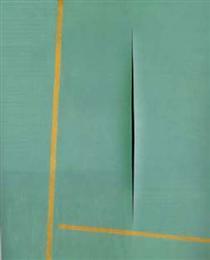 In 1935 he joined the association Abstraction-Création in Paris and from 1936 to 1949 made expressionnist sculptures in ceramic and bronze. 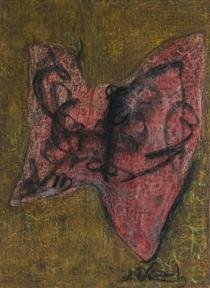 In 1939, he joined the Corrente, a Milan group of expressionist artists. In 1940 he returned to Argentina. In Buenos Aires (1946) he founded the Altamira academy together with some of his students, and made public the White Manifesto, where it is stated that "Matter, colour and sound in motion are the phenomena whose simultaneous development makes up the new art". 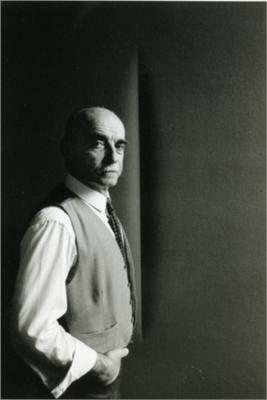 In the text, which Fontana did not sign but to which he actively contributed, he began to formulate the theories that he was to expand as Spazialismo, or Spatialism, in five manifestos from 1947 to 1952. Upon his return from Argentina in 1947, he supported, along with writers and philosophers, the first manifesto of spatialism (Spazialismo)**. 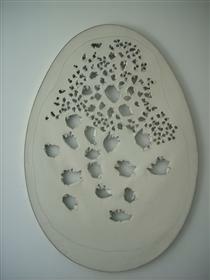 Fontana had found his studio and works completely destroyed in the Allied bombings of Milan, but soon also resumed his ceramics works in Albisola. In Milan, he collaborated with noted Milanese architects to decorate several new buildings that were part of the effort to reconstruct the city after the war. 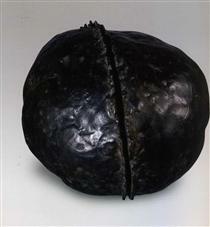 Following his return to Italy in 1948 Fontana exhibited his first Ambiente spaziale a luce nera (Spatial Environment) (1949) at the Galleria del Naviglio in Milan, a temporary installation consisting of a giant amoeba-like shape suspended in the void in a darkened room and lit by neon light. 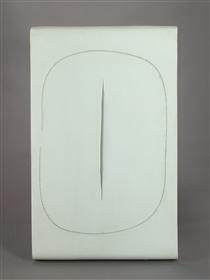 From 1949 on he started the so-called Spatial Concept or slash series, consisting in holes or slashes on the surface of monochrome paintings, drawing a sign of what he named "an art for the Space Age". 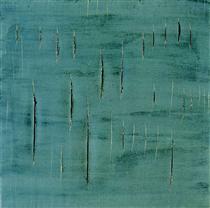 He devised the generic title Concetto spaziale (‘spatial concept’) for these works and used it for almost all his later paintings. 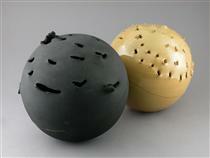 These can be divided into broad categories: the Buchi (‘holes’), beginning in 1949, and the Tagli (‘slashes’), which he instituted in the mid-1950s. 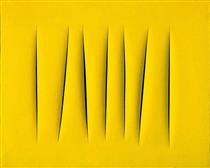 Fontana often lined the reverse of his canvases with black gauze so that the darkness would shimmer behind the open cuts and create a mysterious sense of illusion and depth. 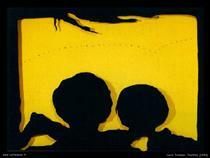 He then created an elaborate neon ceiling called "Luce spaziale" in 1951 for the Triennale in Milan. 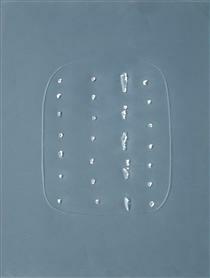 In his important series of Concetto spaziale, La Fine di Dio (1963–64), Fontana uses the egg shape. 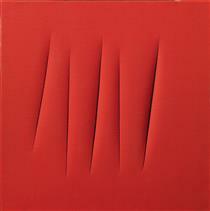 With his Pietre (stones) series, begun in 1952, Fontana fused the sculptural with painting by encrusting the surfaces of his canvases with heavy impasto and colored glass. 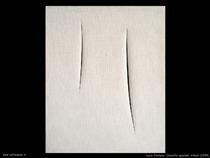 In his Buchi (holes) cycle, begun in 1949-50, he punctured the surface of his canvases, breaking the membrane of two-dimensionality in order to highlight the space behind the picture. 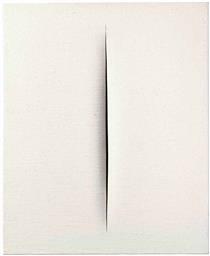 From 1958 he purified his paintings by creating matte, monochrome surfaces, thus focusing the viewer’s attention on the slices that rend the skin of the canvas. 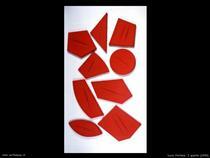 In 1959 Fontana exhibited cut-off paintings with multiple combinable elements (he named the sets quanta), and began Nature, a series of sculptures made by cutting a gash across a sphere of terracotta clay, which he subsequently cast in bronze. 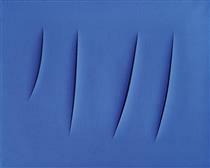 Concept Spatiale Lucio Fontana ?